For other places with the same name, see Gümüşhane (disambiguation). It is suggested that the ancient Thia (Θεία in Greek, a settlement of Roman, Late Roman and Byzantine periods) was located 4 miles west of modern Gümüşhane, in modern Beşkilise. In Byzantine period, there was a town named Tzanicha or Tzantzakon (Τζάνιχα, Τζάντζακον in Byzantine Greek), possibly located 2 miles to the west of Gümüşhane. Around 840 AD, the area was included in the new Roman (Byzantine) province of Chaldia (Χαλδία). It was later ruled by the Byzantine Empire of Trebizond. During Ottoman years, the sanjak of Gümüşhane fell under the administration successively Rum Province, Erzurum Province and Trabzon Province, and was divided into four kazas: Gümüşhane, Torul (capital city Ardassa), Şiran (Cheriana), and Kelkit (Keltik). The sanjak in which Gümüşhane was situated at some stage comprised 37 mines of argentiferous lead and six copper mines. There is no evidence that these mines were in use during Byzantine times. As for the name of the city during the Ottoman period, Greek-speaking population was also using the name Gümüşhane (Γκιμισχανά and Κιουμουσχανά) but, in the first decades of 19th century, the hellenized form Argyrópolis (Αργυρόπολις, from argyros "silver" and polis "city") was established. The Arghyropolis belonged to the Diocese of Chaldie (145 communities, 77,845 inhabitants). During the 1914-1918 Persecution of Greeks, the Turkish authorities boycott the Christians. The boycott deprived the Christians of all they possessed and reduced them to absolute poverty. The organizer of the boycott was the Djemal Azmi, Vali of Trebizonde, under whose orders were the Governor of Arghyropolis and others. In the sterile region of Argliyropolis the distress was great, because the inhabitants were entirely dependent for their existence on their local trade, and that from Russia. General mobilization was also among the causes conducive to the ruin of the Greek communities, for the male inhabitants who supported their families were taken away from their homes. The Turkish officers treated the Greeks shameful and brutal, making many Greeks to desert. This was the situation before the Russian advance. Gümüşhane is surrounded by high mountains, Zigana-Trabzon Mountains to the north, Çimen Mountains to the south, Giresun Mountains to the west and Pulur, Soğanlı Mountains to the east. Trekking is popular sport is at these mountains. Mount Zigana has a ski center on it and it is a well known tourist destination for winter sports. Abdal Musa Peak (3331 m.) is the highest peak within it. The main trees in the forests are Scotch pine and fir, and there are many animals and birds in the area. There are many lakes such as Karanlık Göl, Beş Göller, Artebel Gölü, Kara Göller which are at the peak of Gavurdağı Mountain, and are preserved as natural parks. All these mountains compose 56% of the area of Gümüşhane province. Gümüşhane has a humid continental climate (Köppen climate classification: Dsb on the border Dfb) with cold and snowy winters and warm summers. In the height of summer; July and August, temperatures at midday usually surpass 28 °C, summer nights tend to become very cool due to the high elevation of Gümüşhane, and in winter temperatures usually plummet to -10 °C and even go as low as -20 °C occasionally. Gümüşhane has a rich historical background so there are many historical places, mosques, churches, castles. Ancient city of Satala in the modern village of Sadak was the most important military camp of the ancient Roman Empire in the east. This place was ruled by the Hittites, Assyrians, Urartu, Persians, Pontic Greeks, Romans, and Byzantines. Today, rests of the Sadak village is protected by the Ministry of Culture and Tourism. In addition, Süleymaniye Mosque is in the previous Gümüşhane settlement and it was commissioned by the Ottoman sultan Süleyman the Magnificent. Küçük Mosque and Çit Village Mosque are some of other popular mosques in the city. Besides, there are numerous churches within Gümüşhane. Santa Çakallı, Santa Terzili, Kalur Rock, Samamoni, and Theodor Churches are some examples of historical churches in Gümüşhane. During the medieval period one of the most important guardians of the road connecting Trabzon to Erzincan was the Byzantine fortress located about 2 kilometers northwest of modern Gümüşhane. An archaeological and historical assessment of this site as well as a scaled plan were published in 1985. The impressive circuit walls and defenses are clearly evident at the accessible west approach to the lofty outcrop. In addition to several rooms and cisterns, the castle has two chapels; the easternmost was once covered by a dome. There are numerous large and small caves which owe their formation to the geology - particularly the limestones - of Gümüşhane, including Alicli Agil Cave, Arili Cave, Altınbaşı Cave, Asarönü Ören Cave, Kartalkaya Cave, Ayiini Cave, K.Ardiçli Cave, Karçukuru Cave, Ardiçli Cave, Tepekli Cave, Uçbacalı Cave, Buz Cave and Ikisu Cave. A distinctive local wildflower, bearing purple blossoms in Spring and frequently to be found growing in rock crevices around the mouths of Gümüşhane's many caves, is a member of the nightshade genus Physochlaina : Physochlaina orientalis - a plant rich in medicinally valuable tropane alkaloids of the type found also in belladonna. The cave in Gümüşhane most visited by tourists is the 150 meter-long Karaca Cave, popular because of its speleothems (= dripstone formations), including stalagmites, stalactites, columns and travertine pools. It is a fossil cave located between Torul and Gümüşhane, in which the lime-rich water percolating through fissures in the roof has slowly built up calcite structures of remarkable complexity. Other geological features of Gümüşhane include the numerous plateaux commanding views of the forested areas which surround them. These include the Zigana, Taşköprü, Artabel, Şiran and Kalis plateaux, which form fitting sites for the Summer festivals which are held there annually. Many native tourists participate in these festivals - not only for entertainment's sake, but also to shop for regional delicacies. Pestil and köme are renowned desserts of Gümüşhane, made from mulberries, honey, hazel nuts, walnuts and milk. In addition to köme and pestil, rosehips, apples, and walnuts are notable local foods put to use in the many different desserts which are numbered among the regional specialities of Gümüşhane. Nor is the town's rich food culture restricted to sweetmeats : mantı, lemis, erişte, borani, kuymak, evelek, dolması and siron feature among the savoury dishes local to Gümüşhane. The first residents of Gümüşhane settled in the region just after the fall of Trebizond (1461) and the town soon became a home for miners. Sultan Murad ΙΙΙ (1574–1595) appears to have granted extra privileges to the chief miners and the town prospered and soon became a centre of Hellenism. At the time, it had 60,000 residents. Its trade was increasing and the whole province of Chaldia was on the rise. Another example of its development was that they minted coins with the name Kioumous-hane on them. Another example was the settlement of chief mining families there such as the Sarasites, the Karatsades, the Stavracoglous, the Kalimachidises, the Grigorantons and others. There were also more jewellery shops opening, as well as more hagiography and other arts in the region. The rise in wealth and abundance soon brought positive changes to the communities. From the beginning of the 18th century new schools were opening, and from 1723 the Frontistirion (Greek Tuition Centre) of Argyropolis was in full operation. The tuition centre became an educational institution and spiritual centre of the region. In 1650 the diocese was elevated to archdiocese status, and hundreds of churches and temples were built. New mines rich in minerals were discovered in Ak-dag Maden and Argoni, which resulted in a large exodus of miners from Argyropolis to the new mines. The further dramatic fall in population followed the Russo-Turkish War of 1829–30, when many Pontic Greeks of the area collaborated with or welcomed the Russian army that occupied the area. So as to escape likely Turkish reprisals, the majority of the Pontic Greek population followed the Russian army as it withdrew back into Georgia and Southern Russia, many settling there and joining preexisting communities of Caucasus Greeks that had moved eastwards between the fall of the Empire of Trebizond in 1461 and the 1801 Russian annexation of Georgia, including another community of Pontic Greek miners who had settled in Georgia and Armenia in 1778. Some of the Pontic Greek mining families of Gumushane also settled in Nicomedea, Mesopotamia and other mining regions, from Tiflis to as far as Ak-Dag and the Taurus. During those years tension between the Christian Greek and Muslim population was also growing due to the Greek Revolution and the public reversion to Greek Orthodoxy of many of the Stavriotes, Pontic Greeks who had superficially adopted Turkish Islam in the early Ottoman period but who had remained crypto-Christian in private. During those confusing and troubling times many people became benefactors of Argyropolis, such as the Sarasite family and the influential teacher Georgios Kyriakidis. Kyriakidis identified the need to extract large sums of money from the churches of Saint George, Saint Theodore, Τίμιου Σταυρού and Παναγίας for the educational needs of the town. Sale of church property as well as donations and consecrations resulted in the erection of a new school at the Frontistirion of Argyropolis, a school which was to operate until the Exchange (1923). The Frontistirion comprised a three-grade high school, a seven-grade primary school including scholarship classes, and a six-grade girls' school, as well as a carpet-making technical school. Another public building was the library, the Educational Society Kyriakidis, as well as the Metropolis of Chaldia. The Argyropolitans therefore are very much regarded as having some of the best resources in education, due mainly to their economic rise as a result of mining. After the turmoil and ethnic strife (1914–1923), a few ethnic Pontic Greeks managed to flee to Greece. They settled in the Macedonia region of Northern Greece. A small group which settled in Naousa brought precious items with them from their churches in town, as well as items from the library of the Frontistirion, including rare manuscripts and books. This collection is still in use today and is considered[by whom?] a prized asset of Naousa. The town was occupied by the Russian army on July 20, 1916, but the Russians withdrew on February 15, 1918, after the fall of the czar. After the exchange (1923) no Orthodox remained in the region. Historically, Gümüşhane had mulberry tree plantations for sericulture. ^ Statoids. "Statistical information on districts of Turkey". Retrieved 2008-12-01. ^ Barrington Atlas of the Greek and Roman World: Map by Map directory, p.1237. ^ Procopius of Caesarea, Περί Κτισμάτων, book C, 7. ^ Kiminas 2009, pp. 105. ^ Terezakis Yorgos, Diocese of Chaldia (Ottoman Period), Encyclopaedia of the Hellenic world, Asia Minor. ^ a b Persecution of the Greeks in Turkey, 1914-1918. Constantinople [London, Printed by the Hesperia Press]. 1919. ^ http://www.visiontours.com.au/index.php/tourism-and-travel/activities/caves/ Retrieved 25 April 2017. ^ Prothero, W.G. (1920). Armenia and Kurdistan. London: H.M. Stationery Office. p. 64. The Encyclopedia of Pontian Hellenism. Malliaris Pedia. Falling Rain Genomics, Inc. "Geographical information on Gümüşhane, Turkey". Retrieved 2008-12-01. Turkish Ministry of Culture and Tourism. "Mosques, Mausoleums and Churches in Gümüşhane". Archived from the original on 2012-12-21. Retrieved 2009-03-05. Trabzon, historically known as Trebizond, is a city on the Black Sea coast of northeastern Turkey and the capital of Trabzon Province. Trabzon, located on the historical Silk Road, became a melting pot of religions, languages and culture for centuries and a trade gateway to Persia in the southeast and the Caucasus to the northeast. The Venetian and Genoese merchants paid visits to Trebizond during the medieval period and sold silk, linen and woolen fabric; the Republic of Genoa had an important merchant colony within the city called Leonkastron that played a role to Trebizond similar to the one Galata played to Constantinople. Trabzon formed the basis of several states in its long history and was the capital city of the Empire of Trebizond between 1204 and 1461. During the early modern period, Trabzon, because of the importance of its port, again became a focal point of trade to Persia and the Caucasus. The Empire of Trebizond or the Trapezuntine Empire was a monarchy and one of three successor rump states of the Byzantine Empire that flourished during the 13th through 15th centuries, consisting of the far northeastern corner of Anatolia and the southern Crimea. The empire was formed in 1204 after the Georgian expedition in Chaldia, commanded by Alexios Komnenos a few weeks before the sack of Constantinople. Alexios later declared himself Emperor and established himself in Trebizond. Alexios and David Komnenos, grandsons and last male descendants of deposed Emperor Andronikos I Komnenos, pressed their claims as "Roman Emperors" against Byzantine Emperor Alexios V Doukas. The later Byzantine emperors, as well as Byzantine authors, such as George Pachymeres, Nicephorus Gregoras and to some extent Trapezuntines such as John Lazaropoulos and Basilios Bessarion, regarded the emperors of Trebizond as the “princes of the Lazes”, while the possession of these "princes" was also called Lazica, in other words, their state was known as the Principality of the Lazes. Thus from the point of view of the Byzantine writers connected with the Laskaris and later with the Palaiologos dynasties, the rulers of Trebizond were not emperors. Rize Province is a province of northeast Turkey, on the eastern Black Sea coast between Trabzon and Artvin. The province of Erzurum is to the south. It was formerly known as Lazistan, the designation of the term of Lazistan was officially banned in 1926, by Kemalists. Its capital is the city of Rize. The province is home to Laz, Hemshin, Turkish people and Georgian communities. Turkish president Recep Tayyip Erdoğan spent his early childhood in Rize, where his father was a member of the Turkish Coast Guard. Trabzon Province is a province of Turkey on the Black Sea coast. Located in a strategically important region, Trabzon is one of the oldest trade port cities in Anatolia. Neighbouring provinces are Giresun to the west, Gümüşhane to the southwest, Bayburt to the southeast and Rize to the east. The provincial capital is Trabzon city, and the traffic code is 61. The major ethnic groups are Turks, but the province is also home to a minority of Muslim Pontic Greek speakers, though younger speakers are not always fluent in this language. Lazistan was the Ottoman administrative name for the sanjak, under Trebizond Vilayet, comprising the Laz or Lazuri-speaking population on the southeastern shore of the Black Sea. It covered the land of contemporary Rize Province and the littoral of contemporary Artvin Province. Giresun, formerly Cerasus (Κερασοῦς), is the provincial capital of Giresun Province in the Black Sea Region of northeastern Turkey, about 175 km (109 mi) west of the city of Trabzon. Gümüşhane Province is a province in northern Turkey, bordering Bayburt to the east, Trabzon to the north, Giresun and Erzincan to the west. It covers an area of 6,575 km² and has a population of 129,618 in 2010. The population was 186,953 in 2000. The name Gümüşhane means silver house. The city has a rich mining history and was the source of exports for Trabzon. The Vilayet of Trebizond or Trabzon was a first-level administrative division (vilayet) in the north-eastern part of the Ottoman Empire and corresponding to the area along the eastern Black Sea coastline and the interior highland region of the Pontic Alps. The region was populated mainly by ethnic Turks in the western half and Laz-speaking Muslims in the eastern half, although throughout the period of Ottoman rule there was a history of conversion to Turkish Islam of many of the region's Pontic Greeks - with even Gulbahar Hatun, the mother of sultan Selim the Grim said to be of Pontic Greek origin. Çaykara is a town and district of Trabzon Province in the Black Sea region of Turkey. As of 2014, the District Mayor of Çaykara is Hanefi Tok (AKP). Çaykara village lies in a V-shaped valley along the Solaklı River in the Pontic Mountains, at an elevation of around 300 metres. Çaykara district lies to the south of Dernekpazarı (Kondu) and forms the upper part of the Of-valley system, with peaks reaching to over 3300 meters. The western half of İkizdere district - which lies just east of Çaykara and is now part of Rize province - was historically also part of the same administrative and cultural region. Large swathes of the district are made up of old-growth temperate broadleaf and mixed forest, gradually making way for alpine tundra at higher altitudes. The Laz people or Lazi are an indigenous Kartvelian-speaking ethnic group inhabiting the Black Sea coastal regions of Turkey and Georgia. The Republic of Pontus was a proposed Pontic Greek state on the southern coast of the Black Sea. 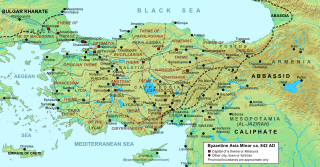 Its territory would have encompassed much of historical Pontus and today forms part of Turkey's Black Sea Region. The proposed state was discussed at the Paris Peace Conference of 1919, but the Greek government of Eleftherios Venizelos feared the precarious position of such a state and so it was included instead in the larger proposed state of Wilsonian Armenia. Ultimately, however, neither state came into existence and the Pontic Greek population was expelled from Turkey after 1922 and resettled in the Soviet Union or in Greek Macedonia. This state of affairs was later formally recognized as part of the population exchange between Greece and Turkey in 1923. In modern Greek right wing political circles, the exchange is seen as inextricable from the contemporaneous Greek genocide. The Greek diaspora in Georgia, which in academic circles is often considered part of the broader, historic community of Pontic Greeks or—more specifically in this region—Caucasus Greeks, is estimated at between 15,000 and 20,000 people to 100,000 down from about 100,000 in 1989. The community has dwindled due to the large wave of repatriation to Greece, as well as emigration to Russia, and in particular Stavropol Krai in the North Caucasus region of southern Russia. The community has established the Union of Greeks in Georgia and there is a Cultural Centre and a newspaper entitled Greek Diaspora. Chaldia was a historical region located in mountainous interior of the eastern Black Sea, northeast Anatolia. Its name was derived from a people called the Chaldoi that inhabited the region in antiquity. Chaldia was used throughout the Byzantine period and was established as a formal theme, known as the Theme of Chaldia, by 840. During the late Middle Ages, it formed the core of the Empire of Trebizond until its fall to the Ottomans in 1461. The Zigana Pass is a mountain pass situated on the Pontic Mountains in Gümüşhane Province close to its border with Trabzon Province in northeastern Turkey. The pass, at 2,032 m (6,667 ft) above sea level, is on the route at a distance of 60 km (37 mi) from Gümüşhane and 120 km (75 mi) from Trabzon at the Black Sea coast. The pass is snow-covered five months a year. New Mount Zigana Tunnel is a road tunnel under construction in the Black Sea Region of Turkey. Located on the provincial border of Gümüşhane and Trabzon, the tunnel will carry routes between Torul, Gümüşhane in the south and Maçka, Trabzon in the north.